One way to back up your iTunes library is to consolidate your library into one folder and then copy that folder to an external hard drive. This is a painless process that only takes a few moments to accomplish. To make the move as easy as possible, it's important to make sure all of the items in your library are in one place. 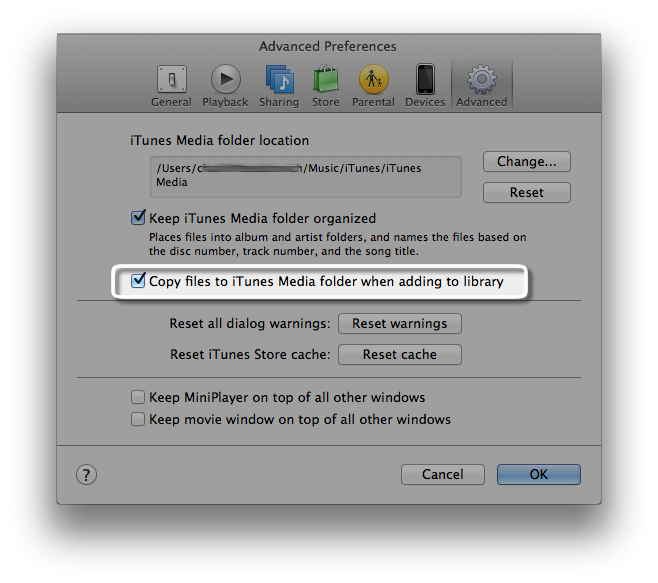 Make sure the option to "Copy files to iTunes Media folder when adding to library" is selected. Note: With this option selected, when you add files to iTunes, iTunes places copies of the originals in the iTunes Media folder. The original files are left in their original locations. To save space on your hard disk, you might want to delete the original files after confirming import. Choose File > Library > Organize Library. Select the option to "Consolidate files." 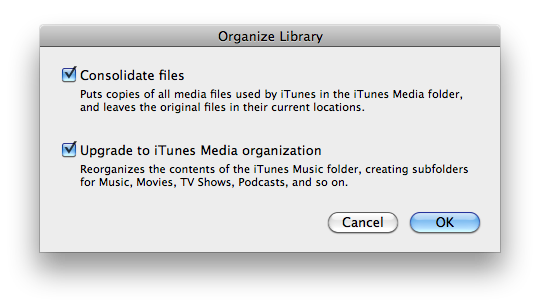 Note: If you recently updated to iTunes 9, you might want to consider selecting the option to "Upgrade to iTunes Media organization." This updates the file organization of your iTunes Media folder. Note: If you originally did not have the option to copy files enabled, iTunes will copy files outside of the iTunes Media folder from their original locations to the iTunes Media folder. To save space on your hard disk, you might want to delete the original files after confirming they have been moved and are backed up. Locate your external hard drive. Mac: On the desktop or Finder sidebar. 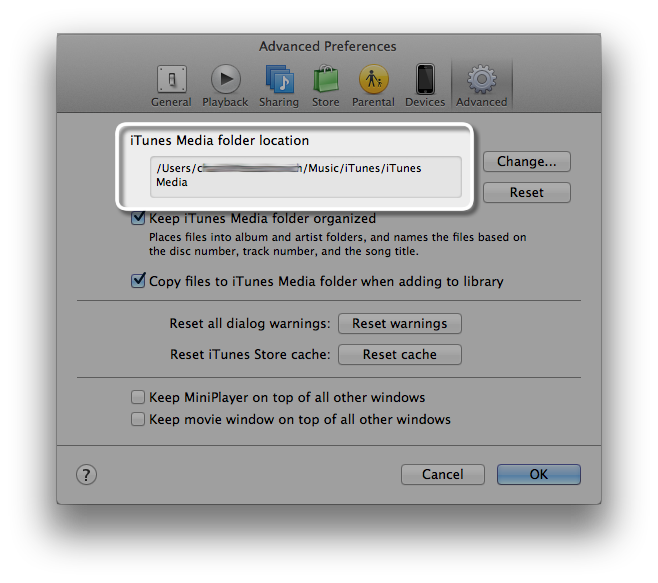 The location of your iTunes folder will be listed in iTunes Media folder location box, as pictured below. 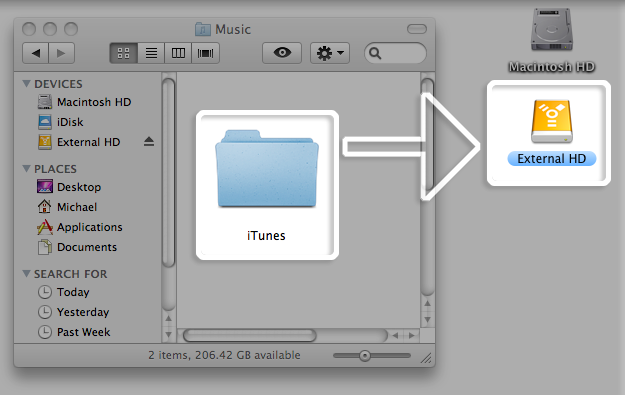 Drag the iTunes folder to your external hard drive. This can take a while if you have a lot of items. When the transfer is complete, your iTunes Library will have been successfully copied to your external hard drive. If you would prefer to back up your iTunes library by burning your library to CD or DVD, click here. If you were looking into moving the iTunes Media folder, view this article for Windows and this article for Mac.